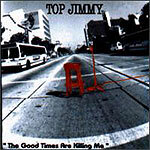 CD review: "The Good Times Are Killing Me"
This review first appeared in the February 7, 1997 issue of the North County Times. This is the raw stuff, the spiritual descendant of Howlin' Wolf and Elmore James. Top Jimmy  a longtime mainstay of the Southern California blues scene  has appeared on several compilations in the past, but this is his first full release as a leader. It's a weird combination of dreaminess and primal blues energy that comes together best on the 12 minutes-plus "Voodoo Sausage" that's more like blues surrealist Little Axe than anything else on the planet. Top Jimmy is a rough but effective singer and an impassioned guitarist. But he's more than a performer: The man has a vision for what the blues should be, and it's sometimes pretty weird, and always challenging. The only places where it falls short are in a couple of passages where Top Jimmy seems to be in some kind of Jim Morrison homage, or maybe it's a Doors parody. Fortunately, they're short and the rest of the album is definitely worth checking out.